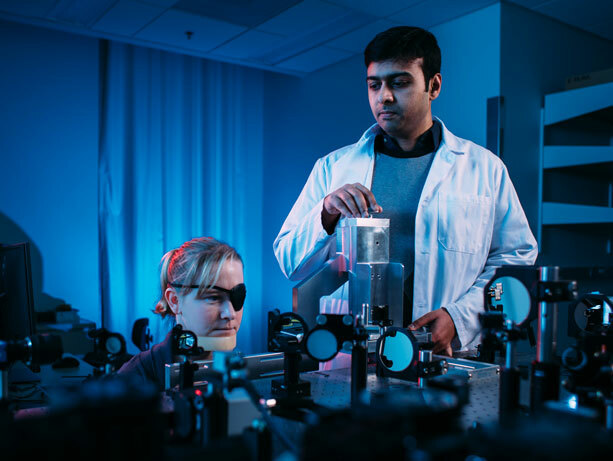 UW Medicine scientist Ramkumar Sabesan, a research assistant professor in ophthalmology, is examining the building blocks of sight: cone photo receptors, cells in a retina that initiate the process of vision. He hopes to advance understanding of how retinal disease begins and, in doing so, to give rise to therapies. Sabesan’s field of research, adaptive optics, recently got a boost. In December, Research to Prevent Blindness, a New York-based organization that funds vision research, awarded Sabesan a $300,000 career-development award. “With the strength of the project and the excellence of mentors involved, we think Dr. Sabesan has very good potential to become a major vision researcher who makes important contributions to the field of vision science, therefore we are investing in his future,” said Brian Holland, the organization's president. Could you briefly describe what you're studying? Our project is to measure properties of cone photo receptors in a living human retina. These receptors are the ones that capture light and funnel them down to the other retinal neurons, and are a key ingredient in how we process images and patterns of light falling on the retina. What we proposed to do is build a specialized camera that lets us see these photo receptors in action. Ultimately this camera will be available in clinics and allow doctors greater diagnosis tools. What we would like to do is get more information at a cellular scale out of the retina, to help doctors diagnose diseases at much earlier stages. You can imagine a picture that looks visually and structurally normal. But when we interrogate the retina at a cellular scale, we may detect a dysfunction sooner than what other modalities can do. A doctor then can prescribe medication to intervene early or follow the timecourse of its repair in gene therapy or stem cell therapy. What's involved in getting this into clinical use? We will initially do preliminary tests on people with no retinal diseases to establish baselines. Then we would apply these techniques to people with a wide variety of retinal degenerations. Being in a medical center is most helpful here. We have a world-class ophthalmology department where clinicians and clinician-scientists provide care for patients and invent the next generation of treatments. This gives us an opportunity to have a direct impact on the care and the course of treatment for patients and is an aspect of this work that I am truly looking forward to. What's your motivation for this research? When it comes time to test these vision-restoration therapies on a human who has retinal disease, we will now have a way to see if these therapies are acting in the way they should. This will really accelerate the amount of time it will take from going from the (research) bench to somebody’s eye. We hope in the next two to three years, we will be able to have a working system to test patients on. That’s a conservative estimate and I hope we will get there sooner. We are very thankful to Research to Prevent Blindness and honored to have the opportunity to pursue this project.